People have been calling The Big Sick a romantic comedy, but I am not sure that is the most accurate term for this movie. That seems to surface for such a wonderful and powerful film as The Big Sick. Maybe a better term is a relationship comedy. Whatever you call The big Sick, it is an outstanding movie that I thoroughly enjoyed from start to finish. 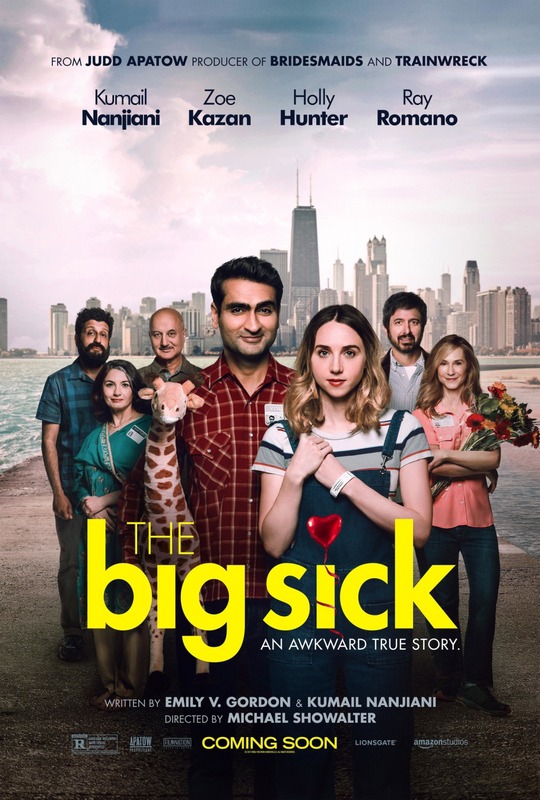 The Big Sick is based on the real life story of Kumail Nanjiani and Emily Gordon, the married couple behind the writing of this movie. Kumail played himself in the film, while Emily is played by Zoe Kazan. After heckling Kumail’s act at a Chicago comedy club, Emily meets him and they start “dating.” However, Kumail’s family is still trying to arrange a marriage for him up with a list of Pakistani women. Kumail’s mother (Zenobia Shroff) is very old school and wants her son to follow all the traditions of Islam. Kumail tried to keep his feelings about Islam away from his mother so he would come to dinner and she would bring in the next woman she had arranged to “drop by” in hopes of fixing him up. However, Kumail and Emily are growing closer the whole time. When the topic of parents came up, the couple found something they could not overcome. Soon after they break up, Emily falls ill and has to be placed in a medically induced coma. Kumail ends up at her side, and has to call her parents. Beth (Holly Hunter) and Terry (Ray Romano) arrive knowing about the problems that drove Kumail and Emily apart, and are displaying their own personal issues. Kumail and Beth and Terry have to spend a good chunk of the second act getting to know each other and bonding over their individual feelings for Emily. The film is downright hysterical. I laughed constantly through The Big Sick. Kumail Nanjiani was wonderful in this. He was laid back and real, with great comedic timing and sharp dialogue. I did not know this was about his real life relationship until the film was over, but you can see that he was amazingly comfortable here. He also carried himself exceptionally well during the more dramatic scenes, including an epic meltdown on the comedy club stage. The rest of the cast is tremendous. Holly Hunter is great Emily’s mother Beth, the over protective mom who simple does not know what she can do to help. And Ray Romano is amazing as Terry, Emily’s father. His deadpan delivery is really funny, and you can see that he has his share of problems. These two parents connecting with the former boyfriend of their daughter is some of the best scenes of this movie. I really found myself connected to these characters and I was seriously concerned that things were not going to work out. Again, I did not know that this was based on their real relationship, and that knowledge might have changed the way I viewed some of the scenes, so, because of that, I am pretty pleased that I did not know that fact. Some of the jokes were really funny, even though some of them play on the racial stereotypes of Muslims. There is a great scene where Holly Hunter nearly gets into a fight in a comedy club with a heckler who is heckling Kumail about his ethnicity. None of these jokes are mean-spirited. They are just smart and funny. Humor helps depower these racial stereotypes and The Big Sick does that brilliantly. I hope people do not take that the wrong way. For example, in the film, Ray Romano says to Kumail that he wants to have a conversation with him about 9-11. Kumail said ‘you never had a conversation about 9-11 with people?’ Romano continued the awkward conversation with a ‘what do you think?’ Kumail said that it was a tragedy and that they lost 19 of their best men that day. I laughed out loud at that line, as he played on Romano’s character’s awkwardness and unintended bigotry with humor. Thing was… while I laughed out loud, I was the only one in the theater that laughed at that. I hope people did not think that was a joke that shouldn’t have been made because laughter can really help cure problems. I really don’t have much to say as a criticism for the movie. Perhaps it was a little too long, but I am not sure what parts I would have left out. I really enjoyed The Big Sick and I think it is one of the best movies of the year.